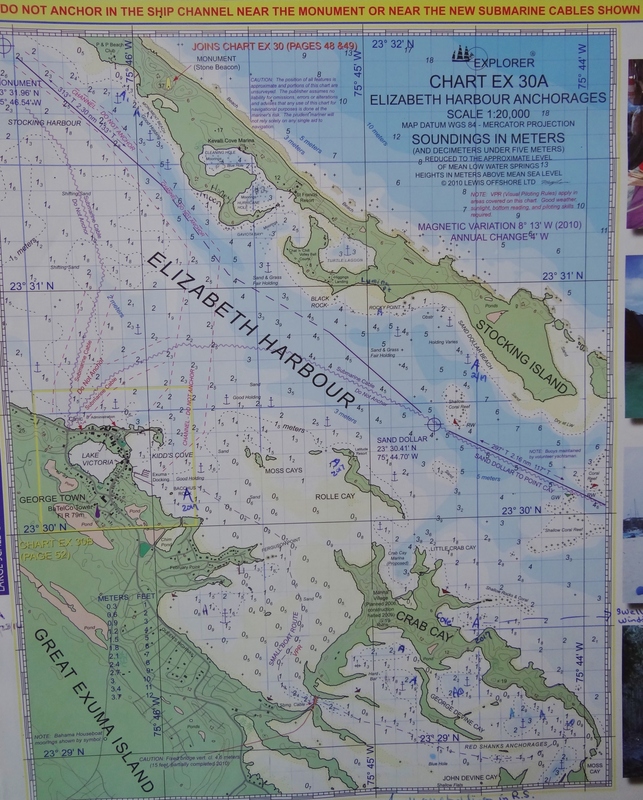 Crab Cay faces the southern part of Stocking Island and Elizabeth Island,with the harbour in between. At the southern end of Crab Cay are the teeny Red Shanks Cays that line the entrance into the Red Shanks anchorages which are basically behind (in the lee of) Crab Cay. 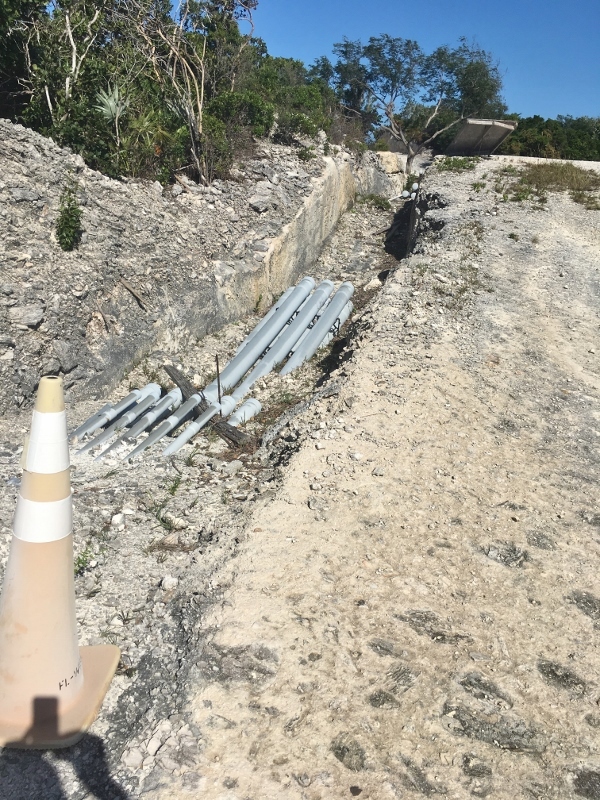 Very close behind Crab Cay is Great Exuma. 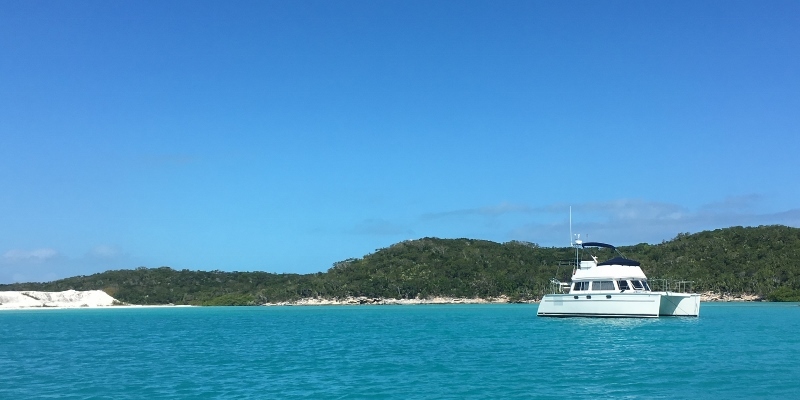 When the wind blows out of the south or south-west boats often seek shelter in the more shallow, protected anchorages behind Crab Cay. 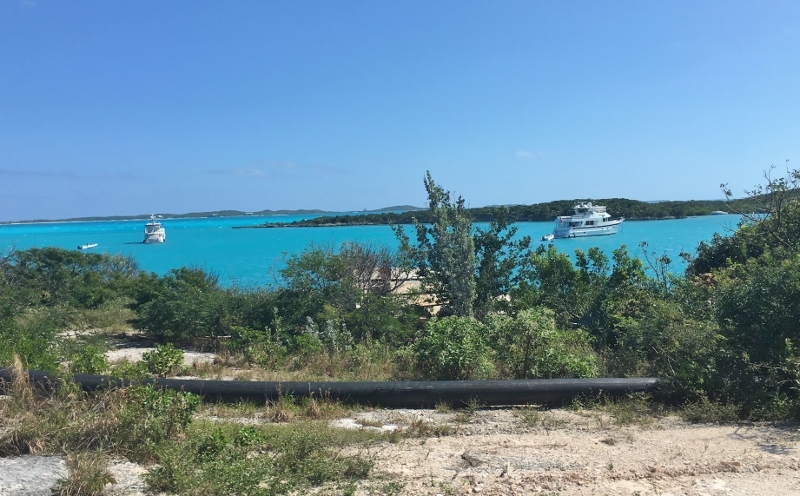 Basics: Big bucks ECO development on Crab Cay- now connected to Great Exuma by a lovely bridge that keeps boats like us from going there via the short route. $800 Million project budget. Several corporations involved- to be built to the highest standards. Phase 1- stopped 2009. A marina for yachts to 300 ft and a Harbor Village with Resort and Spa was in process.. and that’s as far as it went. The marina basin dredged and pilings stacked on shore ready to use. Sir William Walker Ruins: very little info on-line, but here’s what we found. S/v Little Sister had told us about the ruins years ago, but we never walked up. So in one easy trip ashore we toured ruins- old and recent. 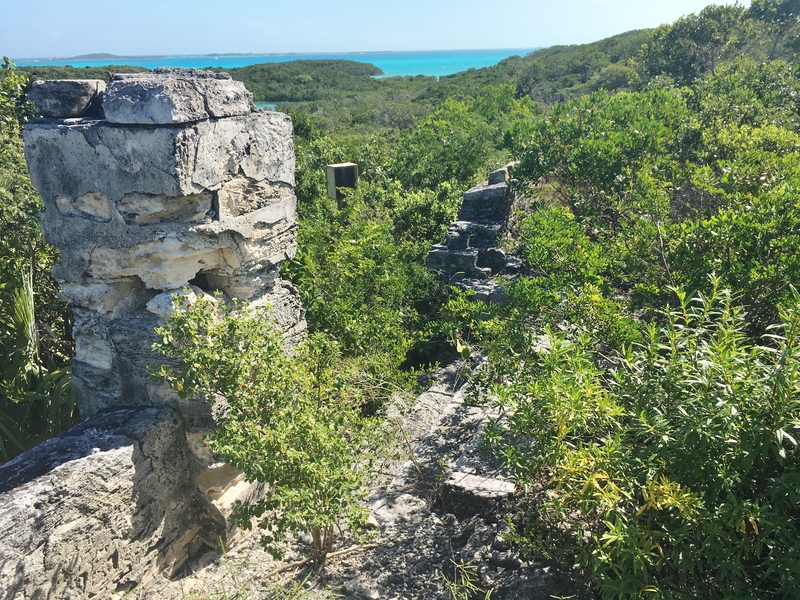 The developers of Crab Cay planned to destroy the Walker Ruins- no surprise there but the one good thing the Bahamian govt did was to demand that the ruins be preserved, and access allowed to anyone. 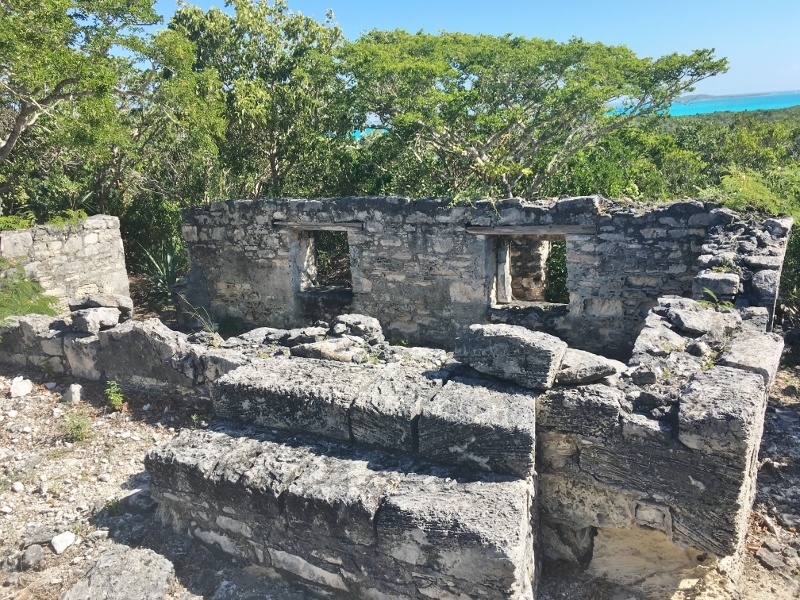 We saw obvious signs of shoring up walls and windows and of clearing the land of the main house area, as well as the short rocky path from the development’s road to the ruins. 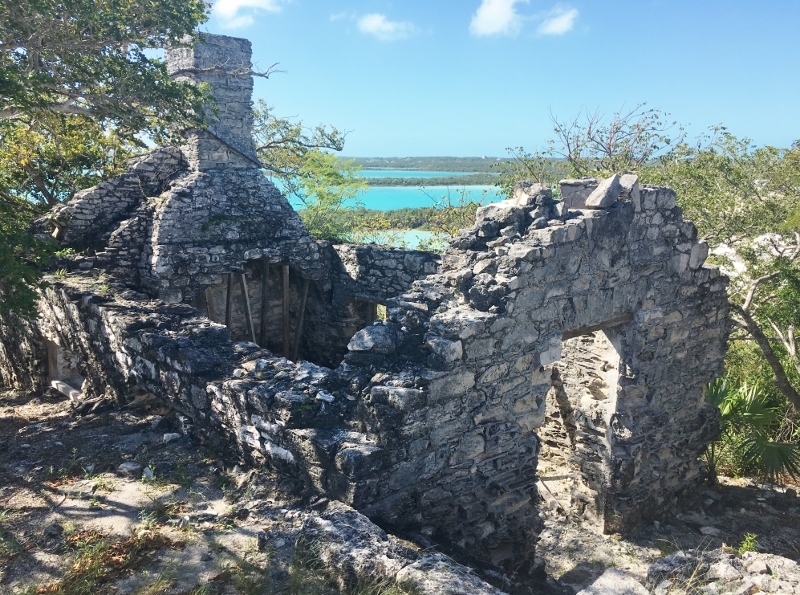 Walker was a Loyalist who came here in the late 1700s and built a stone house and botanical garden atop Crab Cay. The trees and exotic plants were started from cuttings brought back to this area by Her Majesty’s Ships that traveled throughout the Atlantic and Pacific- think HMS Bounty. 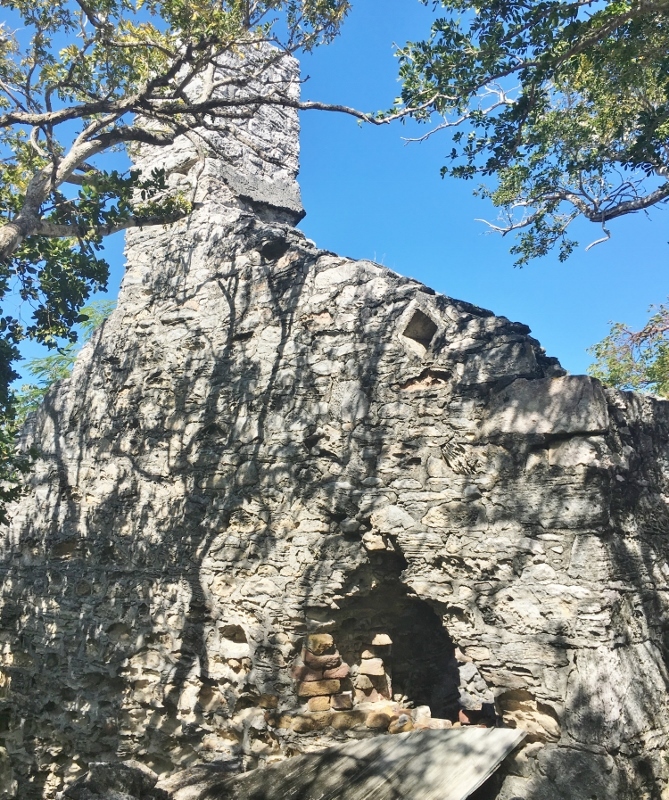 The house was impressive, considering the effort involved in building a stone structure on an island off an island in the 1700s! The site contained high stone walls, peaked entrance pillars surrounding a botanical garden, and circular platforms held cannons used to ward off……. Guess…. Pirates… of the Caribbean- right? 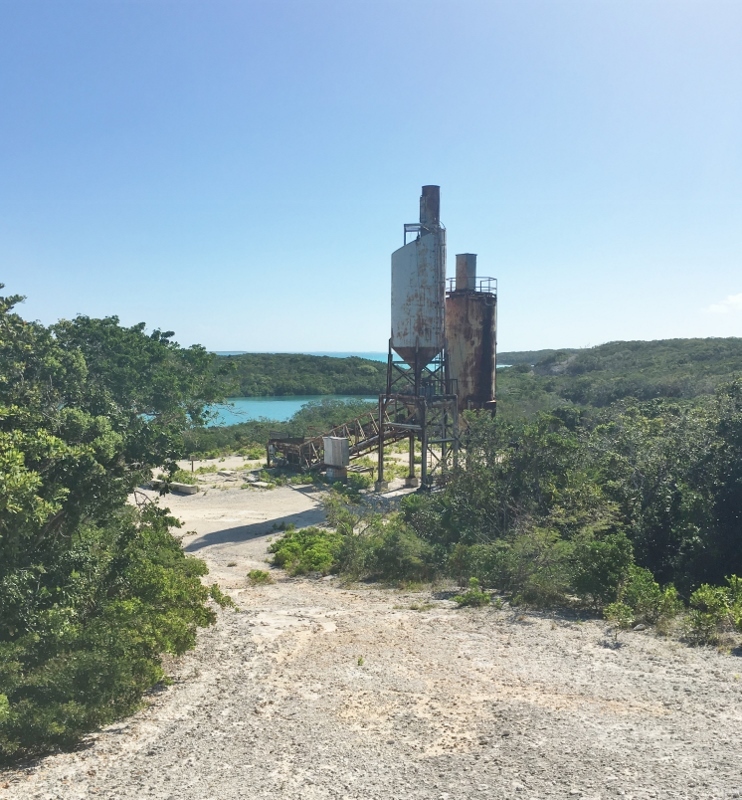 I think you might agree, after reading this and looking at the photos, that Sir William was far more successful than the ambitious developers of Crab Cay. Nice to see Crab Cay and reading you. Is that 68 feet yacht « Private Idaho »? She likes Crab Cay. If so say hello for us to the captain and his Venetian countess from Apollo ll. Our boat is still in Loggerhead. We are now home and returning in 2 weeks…. Hi Jean! Yes that’s Private Idaho- we’d hoped to get in to see her during our GTown stay, but so much east winds we never got to it. We did plan to mention Apollo II! Next year you will need to come down in your new boat-we missed you both. We plan to cross back to FL around April 1 and spend a couple of weeks on a Vero Beach Mooring-we will be close! COngrats on being listed!